The main difference between the regular bench press and the machine bench press is the fact that when you perform the bench press on a machine you don’t have to think for the balance of the weights and to use your stabilizer muscles. The level of security is way bigger than the free weights. 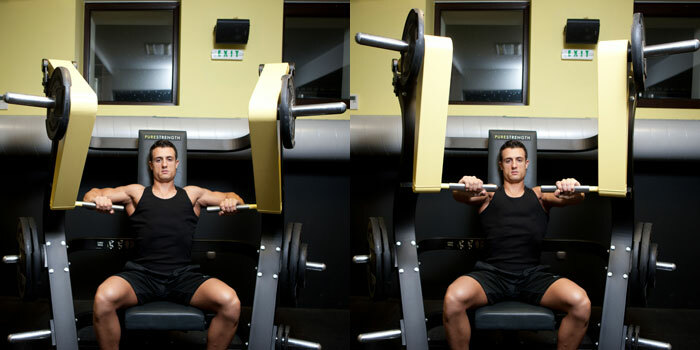 It follows from here that chest press machine is a great choice for absolute beginners and people with shoulder injuries. Also you can perform it at the end of the workout when the stabilizer muscles are tired or just to hit the muscles from a different angle. Set up for the exercise by first selecting the desired weight or add it to the machine if you using free weight machine. Adjust the height of the seat so that the handles are at the level of the lower chest. Then sit on the seat and place your back and head firmly to the backrest. Keep your legs flexed at 90- degree angle and your heels stable on the floor. Grasp the handles with your palms looking down (overhand grip) and bring the handles just right to the side of your chest. This is the starting position. Inhale and start pressing the weight forward as you flex your chest muscles. Stop the movement about 5cm. before your arms are fully extended. Exhale and squeeze your chest muscles for a second then as you control the weight return it back to the starting position. For maximum emphasis on the chest muscles keep your shoulders back and chest puffed out during the movement. Don’t lock out your elbows at the top to minimize the involvement on the triceps and lower the tension on the elbow joints. Use wide of the grip that provides a 90-degree angle between your arms and forearms. The closer grip will create more tension in the triceps muscle and less in the chest. And the wider grip will put too much strain on your shoulder joint. Use a partner to give you the handles for your heavy sets and start from the top position.